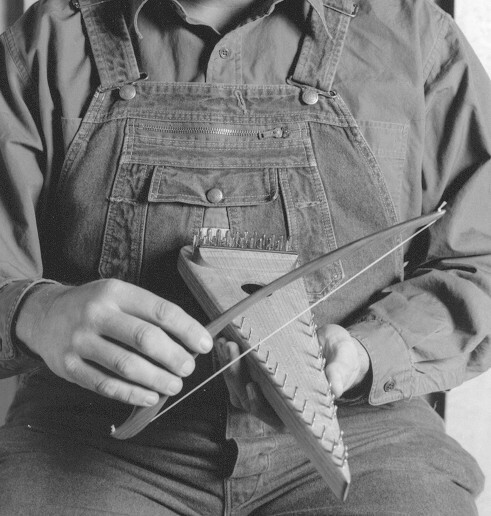 I'll be adding some new video examples of how to play the bowed psaltery on this page. I'll start with a few videos from my new Youtube Channel. Click here to find me and all my videos on my Youtube channel. In order to save a little space on here I'll make the video screen smaller. When it starts playing you can click on it again to go to Youtube and watch it full size. The first two I'll add here are of two baritone bowed psalteries being played in a jam session. Go to the soprano, tenor, and baritone pages for more videos. 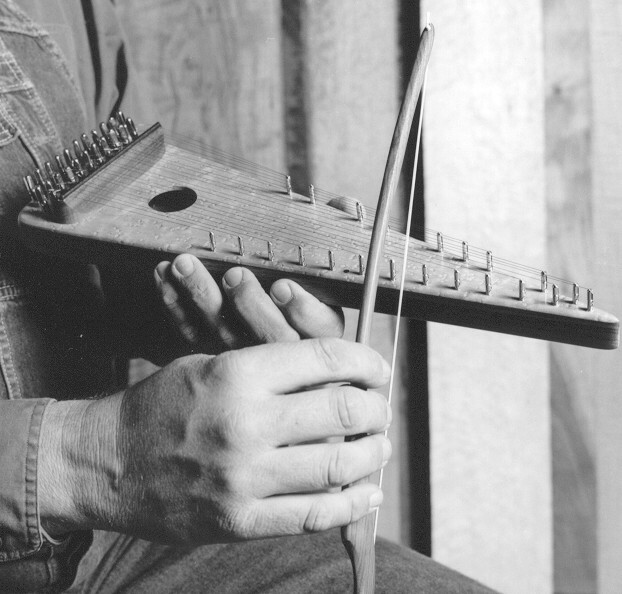 I wanted to explain the basics of playing the bowed psaltery. I know there are some folks that have not seen a bowed psaltery played. Here are some pictures of the way I hold the psaltery when playing. It is best to hold the bow with just your fingertips. This will give you a better feel with the bow and also a lighter touch. Bowing just toward you from each pin along the side will sound out a different note. The notes along the right side are like the white keys on a piano starting at "C" at the tip and going up to an "A" in the next octave. The black dot you see between two of the pins marks the octave at "C". Moving from one note to the next it is best to alternate the bowing motion. If you pull the bow on one note you will push on the next. This will give you a more flowing motion and make your songs sound smoother. This will also help greatly when you play a song that has a faster tempo. The pins along the left side are your sharps and flats, like the black keys on a piano. This is what gives you a chromatic tuning. You will reach across the top to play these. I find it easier to reach these if I tip the psaltery slightly toward the bow. Notice in this photo that my hand is cupped so that I'm not touching the wood on the back of the psaltery. This is so the wood of the back is free to vibrate and will give you more sound. Another thing to notice is that I have the bottom of the psaltery planted against my abdomen. This will help in holding the psaltery steady while playing. This is especially important when playing a faster song where the motion of the bowing arm can cause the psaltery to move around slightly. All this will help to smooth out your playing. These are some tunes I recorded at a jam session with my friend Terry Lewis. Terry is a great appalachian dulcimer player and we were able to get together at a demo I was doing at the Southern Highlands Craft Guild shop in the visitors center at Cumberland Gap Park. I thought you might enjoy hearing the bowed psaltery used in a setting other than a professional recording. You'll hear some noise from customers milling around, a mistake or two, and maybe a cough here and there. I hope you enjoy them. Here are some examples of what the bowed psaltery sounds like when played along with other instruments in a jam. There are four songs here that were recorded at a dulcimer festival on 5-1-2009. I attended the festival and had a great time. I discovered a group jamming under a small tent close to my space in the campground. I asked if they were practicing to perform at at the festival or just jamming. They said jamming, come and join us. I'm glad I did, the majority of the group were living and traveling full time in their RV's. All nice folks and very talented, though they couldn't be nudged into playing at the open stage portion of the festival. I played a tenor psaltery in all these tunes, some were new to me and I ended up just playing some drones and whatever harmony parts I could think to add. Lots of fun!! 11-29-11 I have added four new videos of the bowed psaltery in action along with my friends Terry Lewis on Appalachian Dulcimer, and Jim Collins on Upright Bass. The psaltery I am playing is a tenor model. It is one that I have converted to play in the key of D, but still be chromatic. This allows for the full D scale to be along the right side. I always play this one at dulcimer jams. The key is mostly D and this allows me to have the notes I need to double bow with melody/harmony. You will see this several times in the videos. I still have my C and F notes, on the left side, to be able to switch to a different key quickly, if needed. A psaltery like this would be a special order. Just contact me if you want to know more. 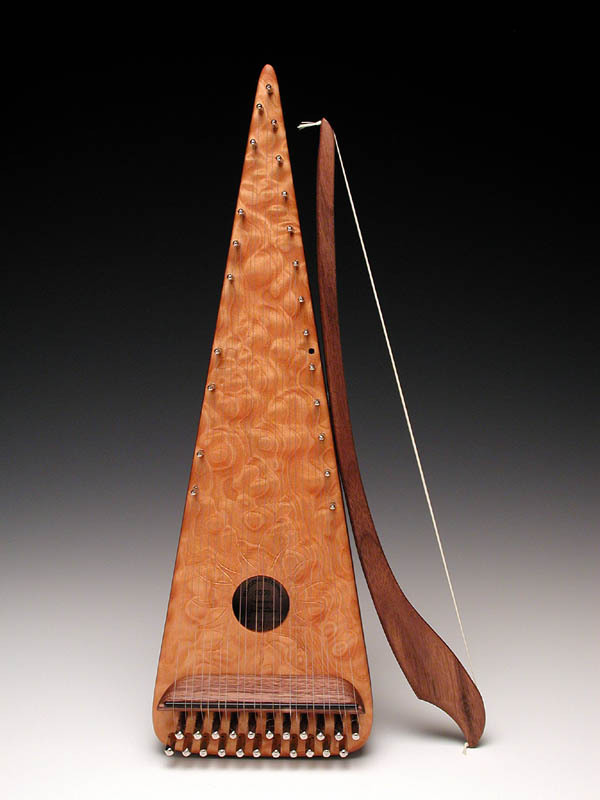 It wouldn't be the best for an all around psaltery, but you can't beat it for playing along with dulcimers, especially when using two bows.